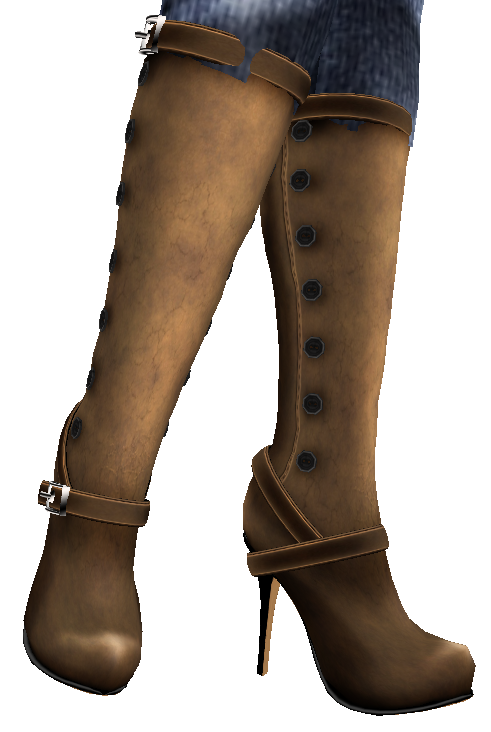 CC NEEDED boots. Versatile Suede Boots, with not too many straps n buckles, but not too plain, not too high of a heel but high enough. A little bit of Victorian aesthetic wouldn't be bad either. Platform would be okay as long as it was a hidden platform and not too high. You know, victorian tinged fashionista window shopping boots. Boots that were "Just Right for CC" CC's friend Lissa Maertens at Cattiva made boots, not just for CC but all the grid to buy! This is the brown, and there will be a dark brown eventually. I also have them in a luscious black suede as well. 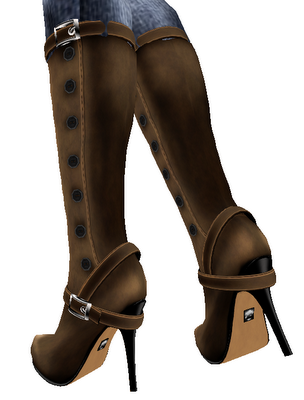 I love these boots enough that if I was a young fashionista in RL that could handle the heel, I'd want these boots. And I've already received positive comments on them on flickr from a Caledonian. And yes, the name of the boots was inspired by the famed Seven League Boots of folklore. I'd been wanting a pink lady-who-lunches suit and found one at Ivalde, via Marketplace. Surprised I hadn't seen it or found it before. Turns out it's an older release, 2008 vintage, but still pretty nice. It's not a work suit, this is what you wear to your charity luncheons and whatnot. The damask is rather subtle, I can barely see it with my bad eyes, and it has satin lapels. The skirt would probably be a touch more flattering on me if it was a touch shorter, but it's the "right" length for it's actual purpose. You'll notice the sleeve attachments have that shading/lighting issue, but it's not as noticeable in the black version, which I also have. This was a pleasant surprise in my inventory. I received a blogger package of a "Mara Jumper" from Ibizarre, which I hadn't heard of before. It's just a simply cute ribbed turtleneck sweater with a little pouch in front. I'm pairing it with a pencil skirt with Whippet & Buck to show it's "dress it up" potential. I love how the turtleneck isn't snug, I loathe snug turtlenecks in RL. It hit my inventory at a good time too, since I was jonesing for a cute sweater. The slightly pushed up sleeves are a nice touch. It comes in several nice fall-ish colors, this is the graphite. And it's only L$150. So thank you for dropping it on me, Anyusha.